Greed, self-interest behind executive, legislature conflict, says VP Yemi Osinbajo – Royal Times of Nigeria. 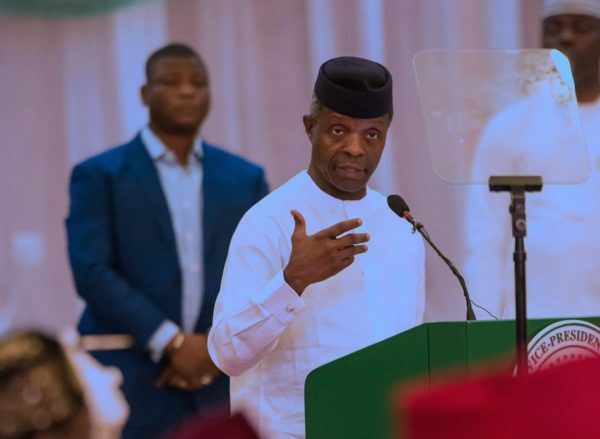 Vice President Yemi Osinbajo has attributed the disagreements between the executive and the legislature to greed, self-interest and hypocrisy. Speaking at a “Dialogue of Organs of Government on Reform of Justice Sector and Campaign Against Corruption” involving the Executive, Legislature and Judiciary organised by the Presidential Advisory Committee Against Corruption (PACAC) in collaboration with the Federal Ministry of Justice which held at the State House Banquet Hall on Tuesday, Osinbajo said despite the principles of separation of powers, there were still tensions and conflicts among the arms of government, especially between the executive and the National Assembly. The vice president, who was represented by the Deputy Chief of Staff to the President, Mr. Ade Ipaye, said while absolute separation of powers may be unattainable, the three arms of government must cooperate to maintain a workable government. “When this cooperation happens, it strengthens the democratic process, promotes good governance and responsible leadership, promotes transparency and accountability in governance, assists the executive to be focused and committed to delivering good governance to the citizens and helps the legislature to make efficient laws that will promote good governance and curb corruption,”. Osinbajo said for there to be harmony, each arm must carry out the functions assigned to it by the Constitution effectively and within the limits of its power.